Yantras hold a supreme status amongst all the occult sciences and disciplines. Mantra & Tantra are the elements which helps it. Literally it means an instrument, an apparatus, a Talisman or a mystical diagram. Just as each planet has a mantra, a special sound energy, so too it possesses a special energy pattern. If Mantra is the invisible driving force, it is often the visible means to gain power, wealth, ward off evils/ diseases, nullifies the ill effects of planets, brings luck in love, enhance capabilities etc. It is a medium through which the invisible force or energy acts on individuals. For that medium should be kept sanctified and the man who wears it may also recite the Mantra to enhance the efficacy of the Yantra. The effects lies in the hands of man who energies it. Anybody can draw, but unless it is energized by a "Siddh Mantra', it will not give the desired results. Acquiring Mantra Siddhi is a very difficult task. The energisation can only be done by a competent person. 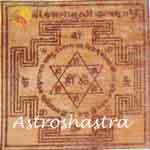 Astroshastra experts energize the yantra for the benefit of person who buys it. It is a technique or a path through which one can attain siddhi, one's desires or remove malefic effects of any planet and is the surest way suggested by our great seers provided they are followed by laid down instructions and rituals. The scholars have laid stress that there is practically no distinction between them and a deity: They are same as a seed and a tree or as a body and a soul. These are Authentic and ancient geometry carved Gold, Silver or Copper plate and in pendants forms, are energized by experts to give maximum benefits to sadhak. Astroshastra is committed to provide world with rare source of energy with purity and certificate of authenticity. They not only authentic but are sent after being energize by rituals mentioned in ancient vedic literature. They plays significant role in the meditative practices as described in our classics. According to sanskrit Dictionary Vachaspatyam "Yantram' is an instrument for holding or restraining. They are geometrical figures intended to represent the basic energies. Just as every elementary geometrical figure, a straight line, a square, a cross or a triangle etc., has a symbolic value corresponding to the basic notions, similarly, they symbolise one or the other power or energy. In other words they are the graphic representations of Mantras. It is a physical manifestation of fine mantra- shakti or its energy body. These are abiding places of all deities whose seat lies at some place, direction, region/ zone, corner or angle and they feel elated at their designated places. In the central place, resides chief deity who is installed and worshipped at that place. These are found placed in ancient temples and places of worship of various sects. They are worshipped at Triputi, Nathdwara, Somnath temples, Amba- mata mandir etc. They are replete with tremendous hidden potential. The entire principle of creation is on the basis of sound (Naad) and the Beej aksharas are the cue to all sources. They are inter-connected. They are connected with different deities coupled with different Mantras. All the five basic elements namely earth, water, fire, air and sky are connected with them through specific use and worship. As (Devas) resides in them and without performing pran-pratishtha or energzing neither one can appease them or attain desired results. They can be drawn, engraved or painted on a variety of substances. The classical eight tantrik surfaces are gold, silver, copper, crystal, birch, bone, hide (which can include any type of paper), and Vishnu stone (shalagrama). They should always be used on the level. If drawn on paper the colours preferable are red, orange, yellow or a combination of these. They can be drawn to whatever size is required. The two main types are Bhu and Meru. The former is flat, two dimensional, the latter is of pyramidal form. In worship they should be placed level on a pedestal or pitha. Before it is made a suitable object for puja, it must be given life (pranapratishta). They are designed to remove the afflictions to obtain a particular result eg. to have a child, to have a positive balance in the bank, or to have the awareness to control one's temper in order to enhance one's performance at work etc. They are inscribed with the mystical inscriptions of the afflicted beneficial planets at a particularly auspicious time to suit the individual wearer.The diagrams such as circles, triangles, squares and even a 'dot' are used . All these represent cosmic energies. A dot known as bindu in Sanskrit symbolizes all pervading space-the origin of all that exists. They are also classified according to their usage. They are known as Sharir , Dhaaran, Aasan, Mandla, Pooja, Chatar or for Darshan, Astroshastra provide these Copper plates with 24 caret Gold polish , to let it effective for more days. Gold being considered the most effective metal for its making, it is always recommened Gold or in alternative Gold polish. i)	Geometric Yantras- These are based on certain geometric designs and are normally written on metals like gold, silver, copper or their alloys. Shree Yantra, Gayatri Yantra, Bhairav Yantra and Yantra for Sun/ Mars falls in this type. ii)	Numerical Yantra- In these numbers are inscribed in a particular sequence. These are normally written on paper, Bhoj patra or bark of a tree. Beesa, Panchdashi and other planetary Yantra falls in this type. They are normally worn with achieving certain specific aims such as cure from disease, financial gain, success in career/ business, victory in court cases/ election etc. Such are prepared with full dedication and charged with energy of the concerned deity by propitiating the planet and chanting different mantras for a specific period and time. 1. Ancient text says that Deities or Lord of the Yantras resides in the geometry, that is their permanent place of residence. 2. Their geometry emit positive Energy , it remove the negativity of the surroundings. 3. They never give negative impact. 4. Easy to place at home, office or Factory. 5. Deity stays in them and need little rituals for their blessings. Construction - How are they made ? 1. Bindu or zero is the basic/ first point through which a triangle is developed and this triangle indicates various desires, methods and knowledge. This Bindu is a way to realization by concentration, and when it is expanded can form various types of triangles. Other figures may be straight, round, long, broad or in any form. Such forms are called Yantras and their Sadhana is called Yantra-Shakti. 2. They are normally worn with achieving certain specific aims such as cure from disease, financial gain, success in career/ business, victory in court cases/ election etc. Such Yantras should be prepared with full dedication and charged with energy of the concerned deity by propitiating the planet and chanting different mantras for a specific period and time. One has also to study thoroughly the horoscope before suggesting any Yantra e.g. a native suffering from acute financial crisis will not be benefited by wearing "Sudarshan Yantra", if his house of finance is afflicted by some other planets or if he running the period or sub-period of lord of house of expenditure, until and unless the concerned planet is propitiated first.